ta…hard to explain briefly, but I shall endeavor. Firstly, I’m going to discard the comment about NiTe being necessary for genius, because anyone of any type can be a genius. Albert Einstein is in the queue, and he’s definitely not an NiTe user. 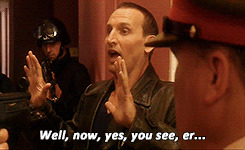 Most of the Doctors in Doctor Who aren’t NiTe users. Then of course, there’s the question of what genius is. Can one be a genius seamstress? Or must genius only apply to certain applications of the brain (namely academics)? I’d even say there are plenty of geniuses who’ve never been to school in their lives. I’m just being picky because I hate being called a genius constantly by everyone who knows me. However, you’re right to a certain extent about the NiSe thing when it comes to using the memory palace (I’ll explain later). The basic idea is that the user constructs what we call a “memory palace” inside the mind. We visually memorize the layout and appearance of a place (real or imagined) and use it to literally store information that we want to remember. I use a combination of both. For quick storage, I use my real-life house: I store to-do list items in my bedroom and Kepler’s laws rotate about the sewing room etc. I don’t only use one memory palace, so when I use the term “memory palace,” I’m typically referring to my collective memory palaces. I frequently use locations that I’ve completely made up, such as places that I imagined in my novels, and I often use places that are familiar to me from my childhood, such as the woods that I grew up playing in. It doesn’t really matter the place, just so long as you can visualize it distinctly. This is the primary reason for why Se users are going to be better at using the method of loci than Si users. Se users are much more visual in terms of memory than are Si users. I do agree that Ni dominants will be better at this than other Se users, simply because the memory palace system also uses quite a bit of patterns and intuitive connections between seemingly unrelated things. Its all about visuals and symbolism. If you were first introduced to the memory palace through Sherlock, you may have gotten it into your head that having a “mind palace” (as he calls it) will allow you to remember everything indefinitely. This is absolutely not true. First of all, you’re not going to be able to pull something out of your memory palace unless you’ve actually put it there, and secondly, if you don’t remember where you put it, you’ve as good as not put it there. The trick to storing information, is to be able to create a distinct visual image of whatever it is that you’re trying to remember and to place that image in a specific location inside your mind palace. When I’m trying to remember a list, even as simple as a grocery list, I always enter my mind palace and travel the same route through it, placing items at specific locations along this route. This allows me to know exactly which order the items come in. I also layer this information, which means that I may place information from one topic in the same locations as info from a completely different topic. This way, I’m able to make connections between the two that help me to solidly store information that otherwise might be vague and difficult to remember. It takes a LOT of practice to get used to using your brain this way, but trust me, it is the most useful study tip ever to exist. If you don’t want to have to cram-study before a test, use a memory palace –it is so much better than stressing over trying to remember things on a word-based cram session. Notice that this also means that you have to store the information solidly and in advance. Unless of course, the test you’re studying for is just terms…in which case, ten minutes should do it. Those of you who have watched Sherlock are probably wondering about his references to “deleting things,” and yes, I assure you, when it comes to memory palaces, you can delete anything that you put into them. I’ll give an example of how I do this. A couple months ago, I went to sleep without printing out a school assignment. Before climbing into bed, I headed into my memory palace and left behind a very distinct image of a cartoon printer attempting to gormandize my assignment next to my closet. In the morning, re-walked through my memory palace and was reminded to print the assignment. After doing so, I went back into the memory palace, picked up the printer and chucked it out the window. That is literally how I delete things. I throw them out the window, flush them down the toilet, or drop them off a cliff. It’s lovely. In terms of problem solving –the mind palace is not the method you’re looking for. 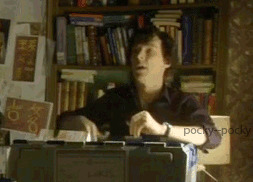 Sherlock uses his mind palace purely to remember things. The crime solving itself happens completely separately, using a combination of deductive and inductive reasoning (though Sherlock claims on deductive). Basically, the only reason it’s particularly useful to him in terms of problem solving is because he’s constantly recording any information that he thinks could be useful to his cases. That’s Ni focus for you. In general, I will say it takes a while to master (less so for NiSe users, as you correctly guessed). Start out small, drill yourself. Practice walking through your mind palace and placing items in it often, and over time, your ability will expand. An INTP here wondering what memory techniques would be useful for my type as you mentioned memory palaces being harder for Si types to use. INTPs may not have a natural proclivity for this technique, but there’s definitely no harm in trying it out. I’d say go for it. Prove everyone wrong. As an infp, i find i have a terrible time remebering things. like, it’s in there, but i cant find it most of the time. would developing a mind pallace be a feasable stratagy to combat this? or is there somthing else that would work better? Write things down in very visible places. Hello, I am wondering if you saw the Sherlock special and if so, what did you think of that episode’s application of Sherlock’s mind palace? The new special? As of Christmas? No. I decided to write instead. I’m very behind on my shows. Also very behind on my writing…but…when has that ever been any different. Well, writing is one of your long term goals, and I would say that a long term goal is more important. Just to get an idea, approximately how long did it take you to master this technique? About deleting things: do you remember the actual deletion process or the fact that it’s no longer there? I’m an INTJ who successfully use the mind palace technique, and I do remember all the things I delete. Perhaps this is simply because I have an unusually good memory to begin with though. I wish deleting things were such an easy thing, haha! However, the real deletion is performed with the aid of a protein called C1q: the synaptic connections (memories) that are less used, get marked by said protein. Later, where the microglial cells detect that mark, they bond to the protein and destroy the synapse. Was I insulting physics? Yes, I suppose I was. Don’t take it personally (though I doubt you will.) I find physics a waste of time, because really, who on earth uses it in their day-to-day lives? I even asked my teacher the old “When am I ever going to use this?” question, and he told me that unless I was planning to be a, oh-what’s it called, a person who studies physics, then no, I would never use physics. Was that a run on-sentence? Maybe. You have aroused my curiosity. Why on earth Henry IV? Is this some connection to a book/movie, or is there another reason? I know technically that questions aren’t supposed to be posed in the comments, but think of this more as a subtle inquiry, if you will. If you won’t, well, I don’t care. I really love a good argument….er…debate. Just don’t start giving me the case for physics, as I have really no logical reason that I don’t like it except that I don’t like it. Whenever I read your articles, I always read the comments, and for some unknown reason it irritates me when people mindlessly agree with each other. I suppose this is why I dislike girly small talk, but I digress. Back to my point of nonconformity-it would go against my very grain to type out ‘yes,yes that’s exactly how I feel.’ Though I too have a strong sense of morals. Part of that is my being a Christian, and the rest is my questioning of everything I’ve ever been taught. Honestly, the sociopath part comes from the often dark thoughts that swirl in my mind. I think sometimes that I’d make a better villain than hero. Heavens, this is long again. Though I suppose it’s only long when compared to the average thought one posts on a blog, next to War and Peace, it’s nothing really. Rereading this, I found is slightly rude. Alas, I was sleep drunk when I wrote it, and in retrospect, my entire frame of writing seems almost bloated. In that light, well, it’s in the light. I don’t see the rudeness…but then, I suppose that’s because I’m very rude myself. Well, I got you to reply to me which was my main objective. Mission: Accomplished. I can now die happy. Firstly, to offer up another prosaic complement, I absolutely adore this blog. It makes me think, and I always enjoy things that challenge me intellectually (unless it’s physics-bleh!) Anyway, I have a mind palace. It’s sort of a French Palace that I invented, with doors lining either wall and a big fountain in the middle of the hallway. The fountain is run on some sort of mechanical gears at the very bottom. I don’t use this palace terribly often, and it was getting dusty (as in, I literally coated it in dust.) I told this to my friend, an INTP, and we decided to stick a maid in there. We choose a horrible person from school, whom I’ll call Lily. I stuck Lily in there, gave her a feather duster and left her alone. A few days later I went into the palace and found Lily DEAD. I’m not kidding, the avatar I had placed in my mind was completely chopped up, with severed limbs scattered all about, and a horrid swath of blood. I knew somehow she had jumped/fallen (?) into the fountain and was churned up by the gears at the bottom. So I sprayed her with a fire hydrant and shot her through the roof, my way of deleting her. But the thing is, I never went into my palace and killed her. Somehow I did it subconsciously. Other than the fact that I walked around for several days feeling like a sociopath, nothing else happened. But really, have you ever experienced such a phenomenon and/or heard of it? Sorry for the length by the way…..
Are you insulting the name of physics? Just when I thought things were going so well. But yeah, that deleting thing does eventually start to become subconscious. The Beeb really has sensationalised it a bit too much with Sherlock (“I have to delete something” I mean, really?). No, I have never subconsciously murdered an imaginary avatar. On the other hand…I do have a dead corpse, a dead king (Henry IV, to be precise) lying in the entry way to one of my memory palaces. I have to pass him every time I enter. The sociopath thing mostly happens in actually real life. I’ll say things that make perfect sense from an objective perspective, but are completely uncalled for in a social or emotional sense. I’ll hurt someone without meaning to and not feel bad about it other than to beat myself over the head for not feeling bad about it. You should feel bad. Why don’t you feel bad? Are you a freaking sociopath? But I know I’m not because I don’t fit several of the major symptoms (one being a lack of moral sense). I’m so obsessively moral I would stand in front of a bullet train before breaking one of my principles. This is not quite the same thing as unconsciously murdering an imaginary avatar, but I have accidentally put things in my mind palace. I have a kiddie pool in the corner of a dining room in one of my mind palaces and one morning I woke up, walked through the palace, and found twelve rubber ducks floating about in it that hadn’t been there previously. So. There’s that. I puzzled over them for a bit, trying to figure out what my subconscious could possibly have been thinking, then gave up and chucked them out the window.